Went to River Sai to test my new Spey rod and new flies i tie for this season. I had to find out which fly line is best.The line weight is #10 to #12.I finally decided to cast with #11 weight long belly floating line. There are many hatch even day time,But no fish rising as normal because of fishing pressure i think and i was sure that fish eating those emerger in the water quietly. My first fish was tiny wild Brown trout.He took my wet clane fly day time. I add one more wild Brown trout after the late lunch. Evening time,Around 6:30 p.m. it was so exited time of the day as there are so many trout rising. We had View more...Went to River Sai to test my new Spey rod and new flies i tie for this season. We had to fish very quietly those trout are very spooky. I succeed lund and just 1 quick photo and released very quick. It was funny that my 18ft rod that i put to the roof Attached at an angle hit Cherry trees hanging on the road while we move to spot by car. Line.Long belly floating #11 weight. 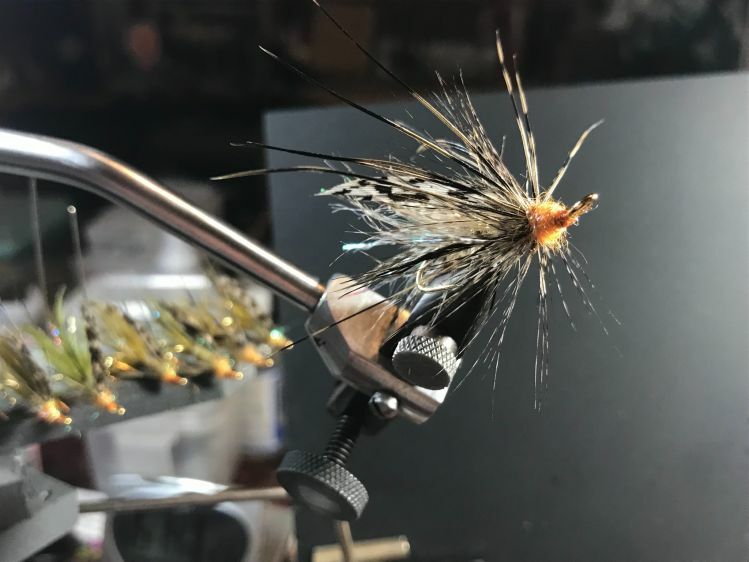 Flies.Wet #6.and Caddis emerger tied to double hook #10.